The South Asia Regional Initiative for Energy (SARI/Energy) was launched in 2000 to promote energy security through increased trade, investment and access to clean sources of power and fuel. 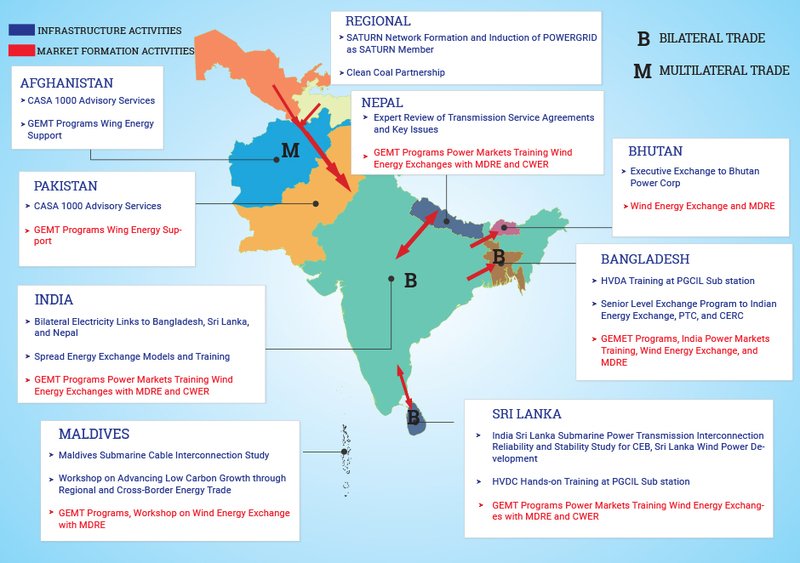 The SARI/Energy activities in the region focused on clean energy trade, energy efficiency, rural energy supply, energy regulation, energy statistics, and private sector involvement. The initial phase gave high emphasis on capacity building and information exchange. Focused on the social-economic aspects of regional energy cooperation, reaching stakeholders who can act as change agents—the media, public leaders, scholars, industrial energy consumers, and trade unions. In Phase II, SARI/E laid the foundation for increased clean energy access and improved market structures to facilitate regional investment in energy trade. It focused on improving policy, legal, and regulatory framework for cross-border energy trade. It identified, assessed, and promoted four of the five cross-border energy trade and investment projects between India and its neighbouring countries. The program also supported bilateral energy projects in Afghanistan to encourage power imports from Central Asia to Afghanistan and the long-term transit of energy to South Asia. It spread awareness of best practices to promote environmentally sound and sustainable energy systems. The activities in the third phase focused on enhanced regional energy security through mutual cooperation and was marked by several tangible accomplishments. A series of technical assistance activities for the development of transmission infrastructure for enabling cross-border energy trade were held. The regional energy market formation was supported through programs that helped energy planners and policymakers in understanding the key energy market trends, latest modelling techniques, and ways to hedge risk. The details of activities on cross-border electricity trade, major cross-border infrastructure, and key energy market formation activities are explained in the figure below.